Since the founding of our great nation, the United States of America, we have placed some sort of importance on the right to bear arms. Americans, like they do with all their freedoms, hold this one particularly close to their hearts. If it weren’t for those early Americans who had extra firearms lying around their homes or the Americans making early firearms, there would not even be a United States to talk about. The founding fathers put the second amendment in the constitution for a reason, to be used. Fast forward to the modern day and because of some unfortunate incidents with guns in our communities, most of the firearms owned by people are either shotguns or handguns. However, if you are a hunter, hiker, camper, etc, it would be a great idea to start thinking about getting a survival gun or rifle. These, often cheap guns, are made with the purpose of being extremely hardy in various weather conditions, as well as being able to be hidden at a moment’s notice. 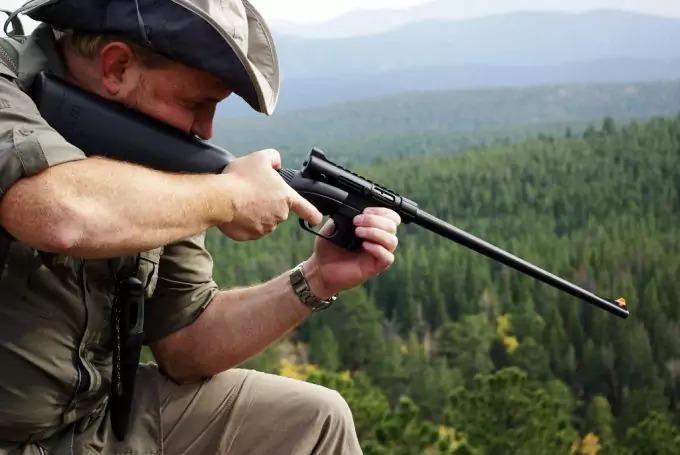 For those who are out in or near the wilderness, a survival rifle will allow you to feel even safer while in a sometimes notoriously dangerous place for animal attacks. While there are countless versions of survival rifles floating around the marketplace, there is one specific rifle that is heads and shoulders above the rest. That particular rifle is the Henry AR-7 Survival Rifle. 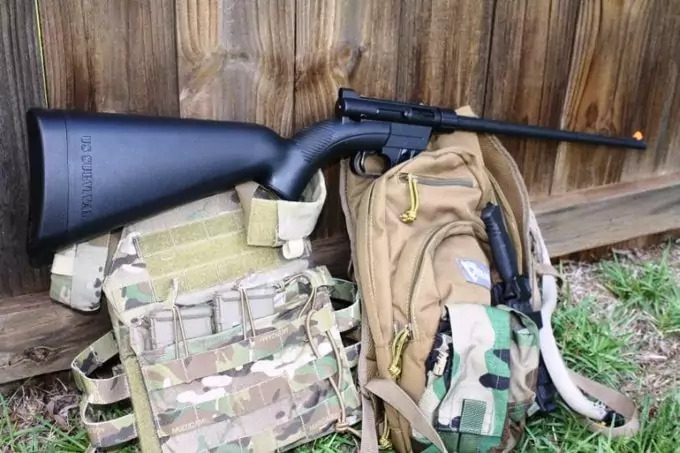 Known for being easy to break down and put in a small, safe place, the Henry AR-7 is a popular survival rifle for people who will be venturing out into potentially harmful situations. 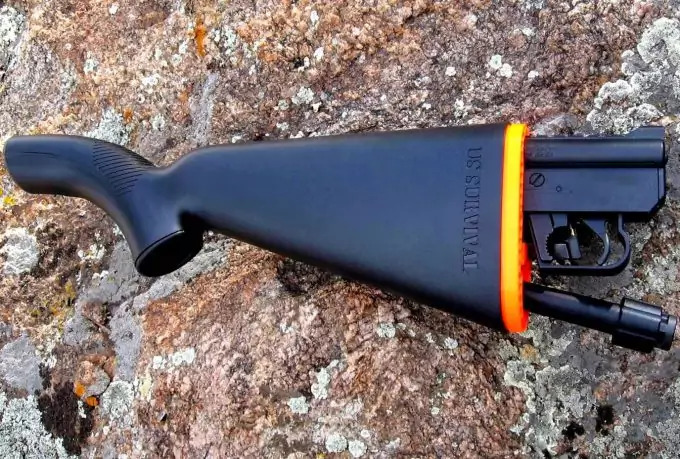 This rifle not only shoots like a standard rifle, but also has some of the most useful features, including a dry compartment to store almost anything that cannot get wet. Don’t make the mistake now; every person that will be entering an unknown area will need a survival rifle. They will specifically need a Henry AR-7 survival rifle. Some of you might think that a survival rifle is too much protection in the wilderness, but I must object to that. After this Henry survival rifle review, you will know how vital the Henry AR-7 can be to feeling safe in every environment. The Henry AR-7 was not the original design, but instead, the AR-7 was made after alterations of previous technology. 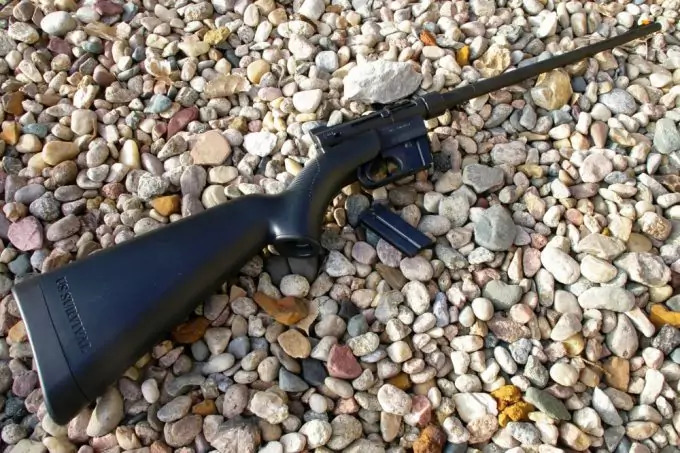 It official began with the introduction of the AR-7 in 1959. Now, the predecessor to the AR-7 was the AR-5. The AR-5 was on all accounts a solid rifle. However this new AR-7 was going to be the pride of the United States Air Force as well as the survival man. After taking inspiration from the AR-5, Eugene Stoner designed and developed a .22 caliber long rifle that would be used as a survival weapon. Stoner knew how to make a gun, the M-16 showed that much. This new long rifle would eventually be adopted by the United States Air Force as the official pilot and aircrew survival weapon. Fast forward a few years and the 1980’s have left the AR-7 in the hands of another manufacture. Henry Repeating Arms had the production rights for the AR-7 passed onto them in the 80’s and began to slightly tweak the AR-7. Today, this Henry Repeating arms rifle is known exclusively as the survival rifle to buy. The original survival weapon was made from plastic, but that design changed recently due to cracking and breaking of the plastic. This particular survival rifle was extremely popular because of the storage compartment in the stock. In the end of the gun, you would be able to store the barrel, magazine, etc. inside so that it would stay compact until it was needed. After today’s designers obtained the blueprints, they realized that it would behoove users if the entire rifle were waterproof. Now, all the Henry Repeating Arms survival rifles are waterproof and have fixed a previous leaking problem with new coating technology. At first glance, the Henry Arms AR-7 seems too small to do any damage in a survival situation, but on the contrary, the AR-7 is a great survival rifle. The short length of the AR-7 allows it to be placed in almost any potential carrying device. You might even mistake it for a household item if it weren’t for the pronounced stock sticking out the back of it. In order to better assess the Henry Arms rifle as a survival rifle, one of the qualifications it must possess is the ability to be assembled and disassembled quickly. The AR-7 passes this test. 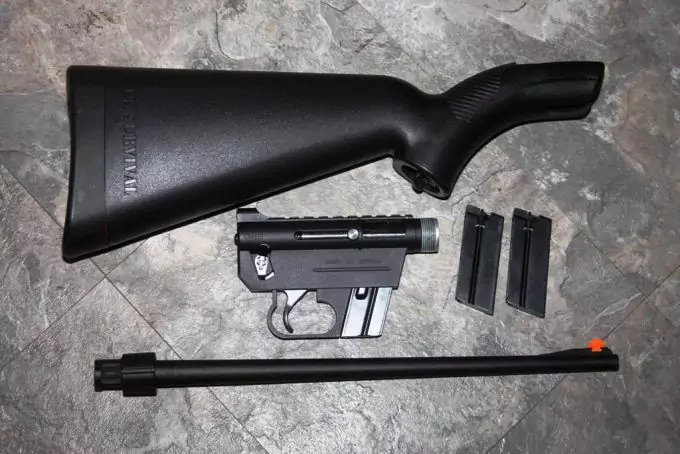 The various parts of the rifle seem to logically fit together and make the assembly so easy a child could do it, although that is not recommended. 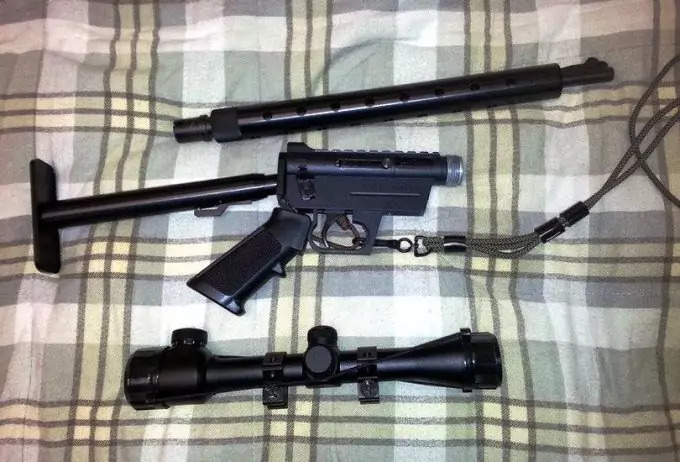 Once the rifle has been put together, you notice right off the bat that it is lightweight, durable, and built to be assembled in a dangerous survival situation. The magazine holds 8 rounds and an additional 8 rounds can be stored in the stock. These rounds can be fired off at a fairly quick pace, but most likely you will want to save those rounds if you are in a survival situation. When it comes to the shape of the firearm, the left side of the gun protrudes out because of the way the rifle is broken down and stored. This has no affect on the rifle’s shooting ability, however. The stock may be uncomfortable up against your shoulder, but when does comfortability really come into play in a situation that would warrant the use of your survival rifle. Some users claim that the trigger is a little on the stiff side, which makes it a little more difficult to shoot smoothly. Although there could be more comfortable ways to design this rifle, and maybe there could be a few things tweaked from the way it looks, but this rifle was made to be used in the direst of situations, so it shouldn’t come with the luxuries we are so used to these days. When it comes to firing the Henry Arms AR-7 survival rifle, there have been long standing rumors that the rifle doesn’t fire well. That is completely false, in fact, the rifle shoots about as well as any rifle made for a survival situation would. No, this rifle won’t kill a target from hundreds of yards away, but why does it? It doesn’t. This rifle does exactly what it is supposed to do, keep you alive within close range. As far as short range shooting goes, the AR-7 passes with flying colors. The orange sights on the end of the barrel let anyone see a distinct difference in the darkness and a deadly target approaching. It has shown great accuracy at short distances. Because this rifle is a .22 caliber, it is especially perfect for the hunting of small game. 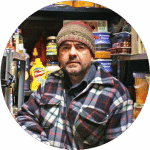 Instead of shredding potential food with a larger bullet, the AR-7 allows the user to kill a small animal without losing any of the potential meat to something like buckshot from a shotgun. Take a look at our piece on how to choose the best air rifle for hunting small game. Also, the deadly accuracy at short range will also help the owners’ ability to hunt small animals. Talking about the specifications of this rifle are all fine and dandy, but you want to know one thing. Will this gun stand up to survival conditions? The short answer is yes. When tested in a rainy situation, the AR-7 was fairly accurate, although not as accurate if it were a sunny day. Slightly disappointing, but not unexpected. No matter how wet the gun gets, it seems to always fire. Even when water is pouring over the barrel, magazine, and trigger, at no point does the gun become waterlogged to the point where it wouldn’t fire. So, this survival rifle does exactly what it was meant to do. This rifle will help in any survival situation and it will hold up to the test of the outdoors. What more could you ask for from this rifle? Not much. On top of the rifle’s ability to work in hazardous conditions, it has little recoil when firing it, which means that it is much easier to hit a target with multiple shots, accurately. The Henry Arms AR-7 survival rifle is an amazing piece of workmanship. The purpose of this review is to better understand everything there is to know about the AR-7 so that you can make an educated decision to buy this survival tool. Knowing the special features and numbers that come along with this rifle can only further your knowledge of the rifle. The AR-7 is a semi-automatic rifle, with a .22 LR caliber round. The .22 is found in smaller rifles, and they are mostly used for shooting small to large organisms. The magazine capacity, as previously mentioned, is 8 rounds, and it comes with 2 magazines. The length of the gun is about 3 feet when assembled. When it is being stored, the AR-7 only takes up an astonishing 16.5 inches of room. That is unbelievable. If nothing else, this rifle will be easy to hide, and keep in an emergency situation. 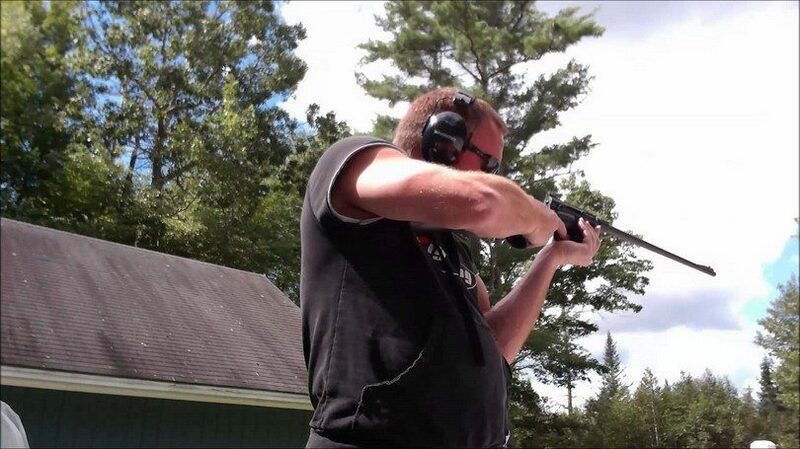 The sights are adjustable in the back of the gun, while the front sights are bright orange and cannot be adjusted. See our article with instructions on how to sight in a rifle for more insight. One of the most interesting aspects of the Henry Arms survival rifle is that it only weighs 3.5 lbs., a lot less than most weapons that powerful. With the rifle being made from ABS plastic, coated with Teflon, and made in the United States of America, there couldn’t be a better survival rifle on the market right now, and possibly ever. The AR-7 has already been here since the late 50’s; it would be smart to assume it will be here for a long time after today. As with anything being sold, the most important part is the price. 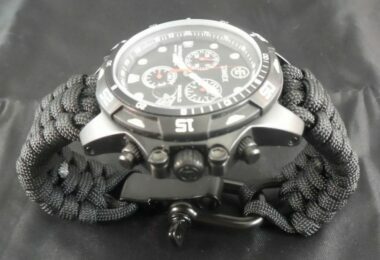 For approximately $275 you will be getting a reliable survival weapon that is waterproof, and easy to use. That is some sort of good deal. With any product, there are certain things that don’t make it into the bulk of the review. For that reason, you need to know more about a few parts of the Henry Arms AR-7 that have gone unmentioned thus far. The AR-7 isn’t going to be a man destroying rifle, meaning that you shouldn’t expect it to destroy any target. Larger targets will not immediately be killed by his rifle, it will take multiple shots. One specific example would be if a bear were to attack you. The survival rifle would probably take a few well-placed shots to kill a massive bear charging towards you. Don’t let that little fact deter you though, because the rifle was built so you can survive, nothing else. The cap at the end of the storage stock has a special feature to it that most guns won’t ever have. It will float. This means that your rifle will float, at least for a short period of time, if it is dropped in deep water. For what it’s worth, the safety is extremely easy to push out and use and won’t accidentally be turned to live fire. All the little parts of this rifle combine to create a stellar piece of survival equipment. Anytime a product that has been around a while gets reviewed, there will always be certain changes to be suggested in order to make the rifle a little better for the customer and purpose it was designed for. The Henry Arms AR-7 survival rifle is no different. Probably first on the list to change is the space in the stock. Being a survival tool, you would think that they would plan for plenty of room for the disassembled gun as well as extra survival objects. The stock should be expanded to hold a few more survival tools. Another slight change would be the amount of buckets in each magazine. While you may be able to survive with 8 rounds in each magazine, more is usually better when it comes to a survival situation. For this reason, the magazine should be upgraded to at least double what it is. The only other thing would be to include a place for a survival knife either outside or inside the stock of the gun. The rest of the rifle should stay just as it is. The Henry Arms AR-7 survival rifle is the best survival rifle out for purchase. It rivals even the best of survival tools, purely due to its’ convenience, durability, reliability, and ease of use. On top of all that, the AR-7 is extremely customizable, and can be altered in many different ways including, but not limited to an ACOG sight. The fact that the rife can float and is waterproof only reinforces the rifle’s reputation for a good survival weapon. Combine the features that come standard on this survival rifle with the relatively cheap price and it seems that there is no other competitor to the AR-7. 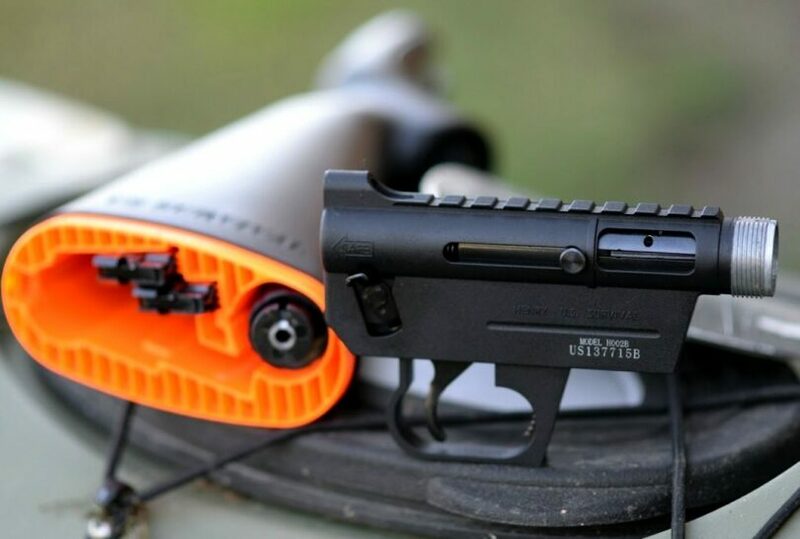 The perfect survival tool for your car, when camping, or even when hunting, the Henry Arms AR-7 survival rifle will keep you alive in the most hazardous situations you can imagine. If you buy this great rifle, then your mind can be at ease that no matter what situation or condition you may face, you will always have a backup plan. In today’s world, feeling safe everywhere you go is priceless for you, your loved ones, and friends. 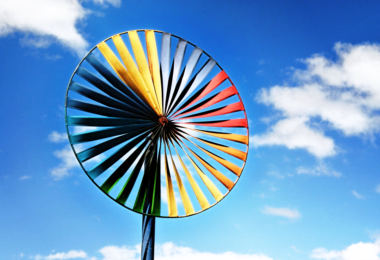 Don’t make the mistake that most people make when they are traveling places. Be prepared, have a plan, and know that if worst comes to worst, you have a plan C that can keep you safe while help is on the way. 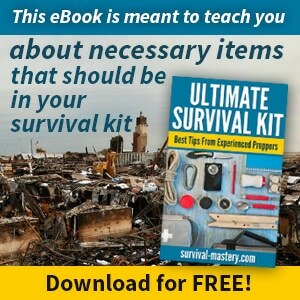 After all, you’re more likely to survive if you pay for the tools that allow you to survive. Check out our review of the best survival rifle for more options.